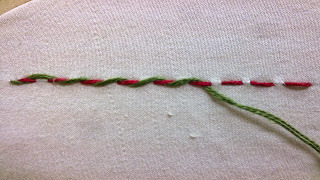 Homespun Stitchworks..... For the love of vintage: Whipped running stitch. When I am creating a piece of work it starts with the idea. I then draw it in my art book, being sure to write in any little notes such as an idea for a stitch or the fabric for the applique work. I sometimes have a little practice on a tiny bit of linen, just embroidering a tiny flower or may be just a small line of something and then it's pinned into my book next to my design. The whipped running stitch is great. If you use the same colour it becomes a great outline or if you use two different colour threads it then becomes a pattern in it's own right. This stitch is versatile and beautiful in it's simplicity.......... Give it ago. I found some pictures to show you so have a look. 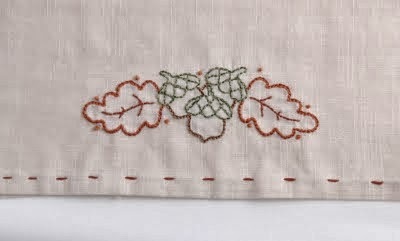 I hope you enjoy your day and that maybe you will give some embroidery ago in some spare time.... it is addictive.